RRB has published the answer keys (Objection Tracker) of RRB NTPC Mains (Stage-2) 2016 from 17-01-2017 to 19-01-2017 on its official website at commendable speed. You may check your answer keys and file objection if found. You may also be able to calculate your estimated marks in RRB NTPC Mains exam. 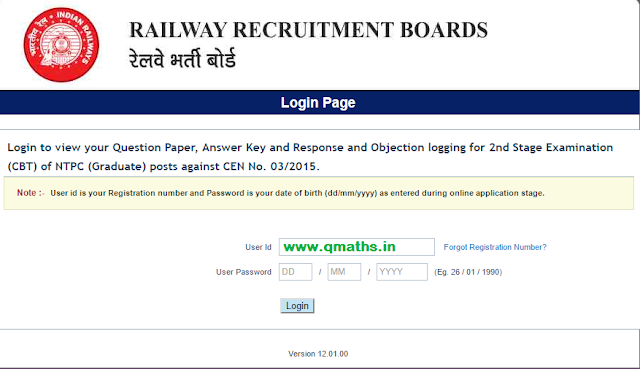 The link to check RRBB NTPC MAINS Answer key is given below. Based on above feedback analysis, cut-off prediction will be posted soon . NOTE: You are requested to e-mail us a PDF copy of your answer key @ Qmaths.in@gmail.com for archive of Previous year Questions paper for everyone's access. Your privacy will be maintained.